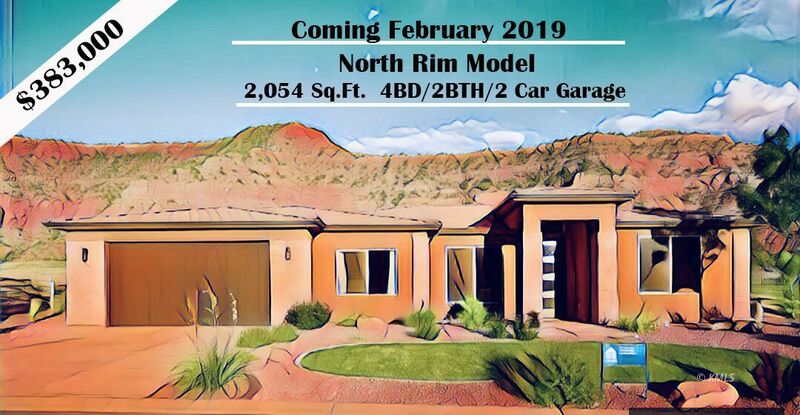 This luxurious 2,054 sq.ft., 4 bedroom, 2 bath "North Rim" Model home is a dream home in Kanab's premier development La Estancia. Located in the heart of Southern Utah surrounded by world-class hiking, mountain biking and canyoneering/climbing directly out your front door. 4 of the best national parks in the entire country, are 90 minutes from this home. This magnificent custom built home is graced by soaring 10'ceilings and wall-to-wall windows making it a haven for gazing at the vermilion cliffs from multiple vantage points. The open kitchen/living room draws you into a voluminous layout made for entertaining and leads to a spacious rear patio for more entertaining. The chef's kitchen is clad with premium finishes and fixtures including stainless steal appliances, a large pantry, large working island, and food prep zones are expertly arranged in this amazing gourmet kitchen. The divine master suite presents ample space, massive windows, private entrance, and an opulent en suite bath will a soaking tub and separate glass shower. La Estancia offers amenities:indoor/outdoor pools, indoor Jacuzzi, private clubhouse that includes a modern exercise room, and the areas only dog park.